Now, how can I change the href for this logo so that it always redirects me to the defined place. This is a newbie's query. please cooperate. By default, the logo URL points to the home page of the current site, there is no any OOTB method to change its default URL! You will need to use The SharePoint Designer to customize the Redirect link as you prefer, check this How to change the link of the logo? Using a custom JS script as mentioned at How to change the url for the site logo that appears on the search results page? Modify the "href" to your blank site url in the code below. 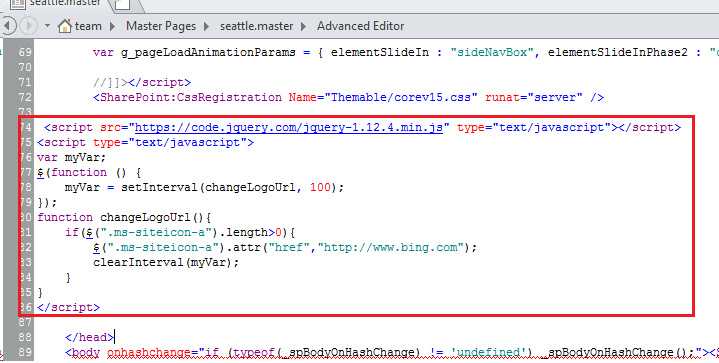 And add the code into master page using SharePoint designer 2013. Not the answer you're looking for? Browse other questions tagged sharepoint-online sharepoint-designer site-logo spurl or ask your own question. How to change the link of the logo?